You better hold onto your socks folks, for they are about to be knocked from your feet. PalmCast Live is back tonight, and though we've been going through a bit of a news deficit, we still want to get together and chat webOS. It's been too long. So tune in tonight at 8:30 PM Eastern (12:30 AM UTC) for the latest edition of PalmCast Live, featuring Derek, Adam, and Tim at their finest. We know that's not saying a lot, but you should feel lucky you didn't see them at the company Thanksgiving party. That was a disaster. Anywho... topics of discussion will include webOS and what the heck is going on with HP (hint: we're not really sure) plus our holiday gift recommendations for that die-hard webOS fan on your shopping list. And of course, we'll be taking your questions on the Twitter, just include the #palmcast hashtag and we'll do our best to provide a reasonable answer on the air. Tonight. 8:30 PM. Be there. 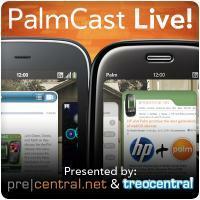 It's PalmCast Live.